Since StarCraft 2 launched on July 27th, users have submitted a veritable buttload of maps to Battle.net. Player-created content has long been a hallmark of Blizzard's realtime strategy games. Since WarCraft II: Tides of Darkness, Blizzard has provided a "Map Editor" for users to tinker with in-game assets and create interesting new maps. Such devotion to creative endeavors has kept fans interested in the game long after they've gotten bored with the content that Blizzard provides. And in 2003, several users contributed to a custom map for WarCraft III called Defense of the Ancients which spawned a whole new genre and a position at Valve for one of its creators. StarCraft 2 was no different and launched with the powerful Galaxy Map Editor included on the disc. 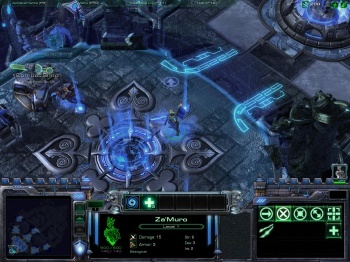 Creative StarCraft fans were quickly able to recreate World of WarCraft and Mario Kart while Blizzard included the Lost Vikings minigame in the StarCraft all using the Editor. It appears that these people were not alone. In an investor conference call, CEO and President of Blizzard Mike Morhaime said that the fans of StarCraft 2 have used the editor provided with the game to create over 65,000 maps. That's a lot of maps. And while not all of them are amazing, there is quite a lot of creativity being displayed. Blizzard announced that it would implement a store on Battle.net so that map-creators would be able charge money for other users to download and play their maps, but this has not yet been implemented. Perhaps with the plethora of maps now available, that system will come soon and the creativity of these users can be rewarded. Only if their maps are any good, of course.